Learn how to make a burlap wreath by weaving ribbons with rustic burlap in this easy step-by-step tutorial. You’ll have a pretty wreath in just a few hours! If you’ve been wondering how to make a burlap wreath, you’ve come to the right place. Today, I’ll show you step-by-step how to make this easy craft, plus I’ve even included a video tutorial. If you’re following home decor trends, you know burlap has been the “IT” fabric for the past few years. It has even shown up in wedding decorations; that’s how popular it has become. Everywhere I look on Pinterest, blogs and other internet sites, I keep seeing these amazing wreaths made of burlap. I also happen to have a nail in the outside wall just to the left of my front door that is begging for some summer decor. A bright, cheerful DIY burlap wreath would be perfect there to greet visitors who arrive at our home. The DIY Burlap Wreath is a quick project that is easy to make. It would be a great project to create with friends or for a girls’ night with a glass of wine. I actually talked my sister, who was visiting, into making one of her own too. We made our wreaths side by side one afternoon while watching a chick flick during the boys’ rest time — it’s THAT easy and fast to make a DIY Burlap Wreath. The only part of the project that took any length of time was waiting for the paint to dry on the wooden letter “Y” I wanted to hang in the center of my wreath. 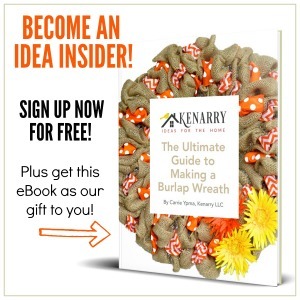 Get our e-book The Ultimate Guide to Making a Burlap Wreath plus a special limited time offer for 25% off Kenarry burlap ribbon when you sign up below. It’s totally FREE! Once you’ve confirmed your e-mail address, we’ll send you the free digital eBook in addition to the coupon code. Plus you’ll have the opportunity to get our weekly Ideas In Your Inbox newsletter as well as access to our resource library stocked with free printables, product discounts and other content that is EXCLUSIVE for Idea Insiders only. Follow this super easy tutorial and you’ll have your own personalized wreath to hang on your door. 60 feet of 5″ wide burlap ribbon or garland (20 yards) — NOTE: If you’re making more than one wreath, you can also get a 4-pack of burlap ribbon rolls (40 yards or 120 feet) or a 6-pack of rolls (60 yards or 180 feet) at a discounted rate. Plus sign up to be a Kenarry Idea Insider and get 25% off your total purchase for a limited time. Here are the step-by-step instructions, with pictures. Don’t forget to pin this post to your craft board or share it on Facebook so you can find this tutorial again. 1. Start the wreath with a knot. Turn the wire wreath frame upside down. 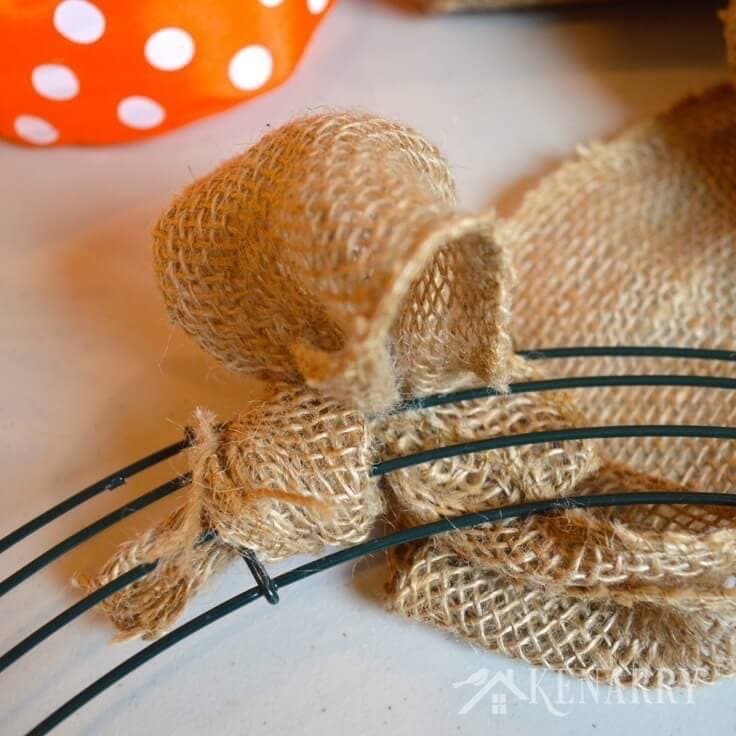 Wrap a small amount of burlap ribbon around one of the center wires in the wire frame and tie a knot as tight as you can leaving only a small tail remaining. 2. 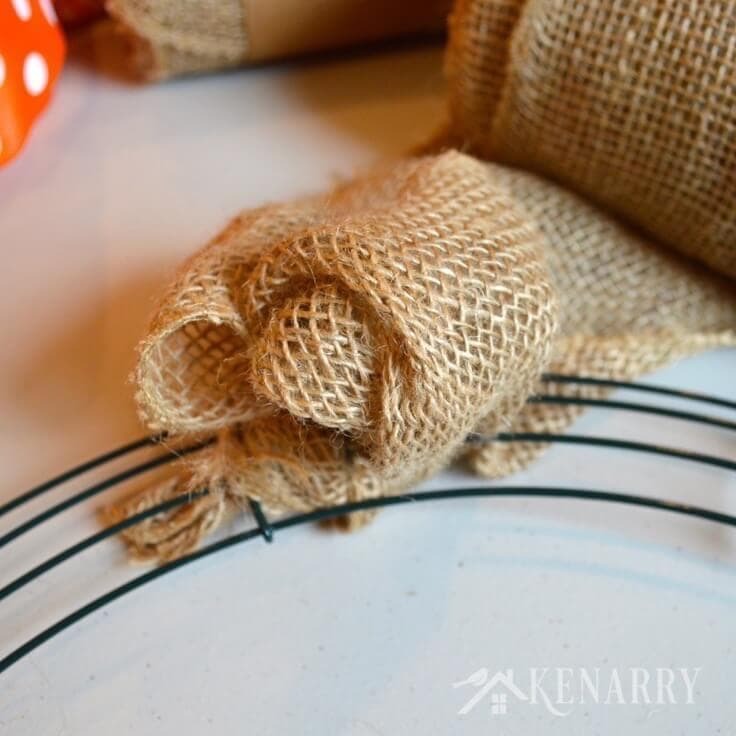 Begin weaving the burlap ribbon through the wire frame. Flip the wire frame around so the top faces you now and the knot you just made is in the back. Gather a small amount of burlap ribbon, like 6-7 inches, into a loop and push it up between two of the wires in the frame. Next, take another 6-7 inches of burlap ribbon, create a loop and twist it once to change the direction. You’ll then push the loop between two of the other wires in the wreath frame so it’s not right next to the first one you pushed through. If you want a full wreath like mine, press your burlap loops together as closely as possible. 3. Add the first accent ribbon. As you did in step one with the burlap ribbon, tie the end of one of your accent ribbons to the wire frame so the knot is on the back side of the DIY Burlap Wreath. Now create a loop using 6-7″ of accent ribbon and push it up between two of the wires in the wreath frame that you haven’t used yet. 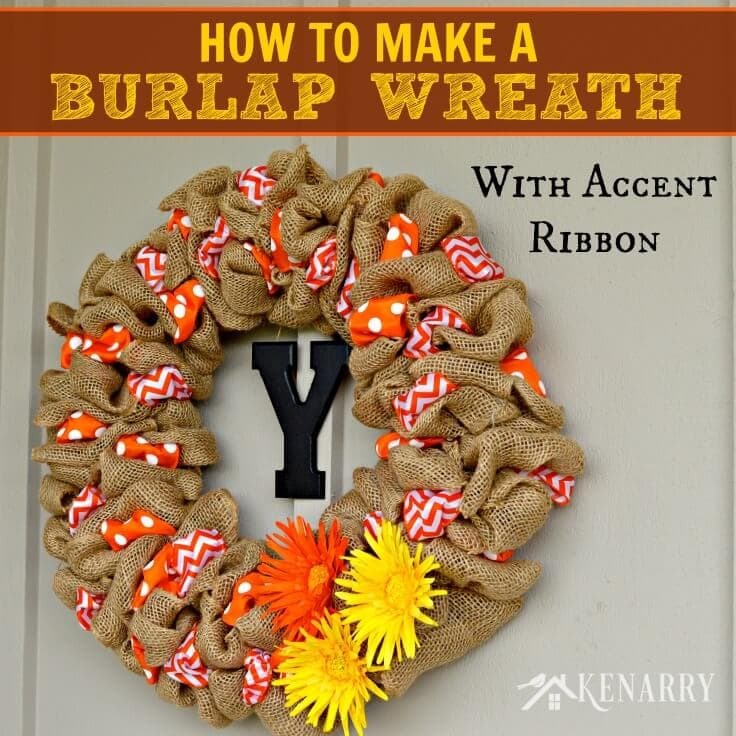 Press the accent ribbon as closely as you can to your burlap loops. Thanks for the great compliment, Angela! So glad you stopped by. 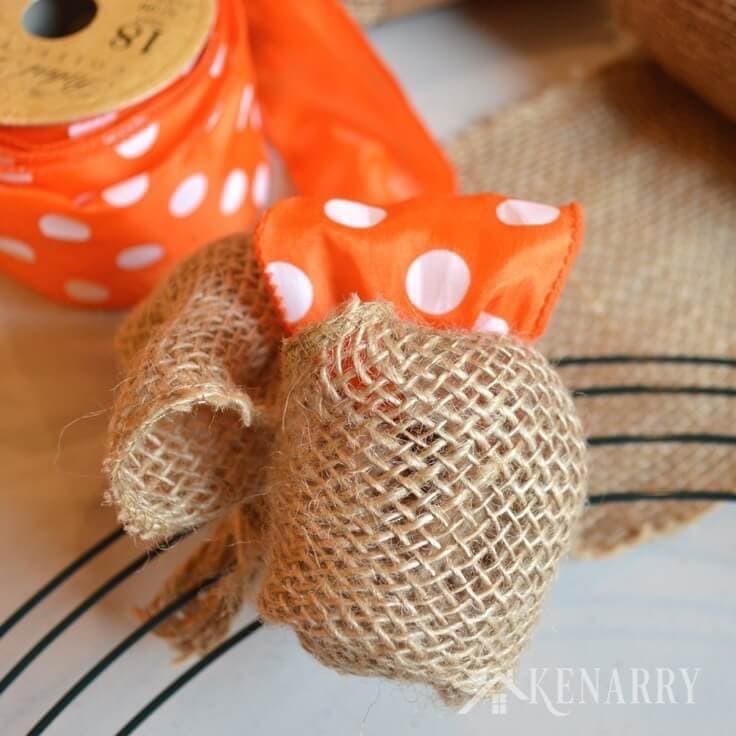 Am I understanding correctly that you are just pulling the ribbon and burlap through in a loop and not making any knots (except the first one) or using any wire to make it stay? I wish you could come to Riverside, CA and have a demonstration night with my sisters and me!! Hi Robyn, it would be so fun to crash your craft night with your sisters to teach you how to make burlap wreaths in person. It is one of my all-time favorite crafts to make. You’re going to love it. Unfortunately Michigan is no where near California so you’ll have to have the next best thing — my video tutoria!. After you pour your glasses of wine and set up your craft stations, you could watch it a time or two on your iPad or a TV and maybe it will feel like I’m there? LOL! Your understanding is spot on correct though. You’ll see in the video, I only tie the burlap ribbon and accent ribbons to the wreath frame at the beginning and the end of each roll. There are no other knots or wire to make it stay in place. When you give it a try, you’ll find that the burlap is really a pretty stiff material. It wedges through the bars in the wire wreath frame fairly tightly. It really won’t move once you push the loops through unless you intentionally tug on it or something. Best wishes and happy crafting! Can you show me how to make the wreath pictured in the blog? The wreath in your video was not the one you made? I love the blue one. Can you make a turorial? I can’t figure it out? Hi Anne, thank you for reaching out to us. I’m sorry to hear you’re having trouble getting started with your burlap wreath. Here’s the link to the written tutorial for the blue one like you see in the video — https://www.kenarry.com/teacher-appreciation-burlap-wreath/ We’ve actually made several burlap wreaths with accent ribbons. The technique is the same as you see in the video; just with different ribbons each time. What a fabulous technique! I think I could manage that! What a great project, Carrie. Thanks, Tasha. It really is SO easy to do – you could totally do it! I must say using the rack is a clever idea! Thanks for sharing. I absolutely love this wreath! I am going go get the materials and make one right away. Thank you so much for the inspiration! Yay! I’m so glad we could inspire you to start a project, Vickie! Let me know how it works out for you. Very cute wreath – I love making them with those wire wreath frames. I have not tried mixing in the ribbon like that before – pinning this so I remember to give it a try. Thanks for pinning, Kimberlee! Hope the method works well for you. I’d love to see what you create. Thanks for the invitation, Jennie! Thanks, Stephanie! What a great idea to pin flowers onto the wreath rather than hot glueing them on so you can change it out for different seasons/holidays! You’ll be amazed at all the burlap ribbon options available these days at Hobby Lobby and other craft stores. Have fun! Love your tutorial for this wreath. I have looked at several other tutorials on how to make these wreaths and did not fully understand, buy now I do!! Thank you so much and for the links on where to buy the materials, I love it when you bloggers do that for us! Oh Sherri! You made my day. I’m so glad you found the tutorial helpful. Amazon is the least expensive place we’ve found to buy the burlap. I’d highly recommend it. Also, do you have a Costco membership? You can buy large rolls of wired ribbon there for the accent ribbons. I just picked up some great holiday ones a few days ago to make a new burlap wreath for Christmas! Just found your tutorial….after I had made my first burlap wreath, which turned out really pretty. BUT I had an accent chevron ribbon I wanted to put in it and could not figure out how to get it in! Did not realize you needed to do it all at the same time…bummer! Not going to re-do. Lesson learned! Now I’m trying to figure out how to use this accent ribbon on it…..Thank you for showing me how (for the next one..). I am absolutely thrilled to have found this. I am going to make one in my daughter’s school colors (which happen to be orange and black!). Cannot wait to get it done. Hopefully I can do it! Thanks so much. I’m thrilled you found us too. What a fun idea to make the wreath in your daughter’s school colors. That sounds fantastic, Carla! I’d love to hear how it turns out for you and see pics. If you share on FB or something, be sure to tag me so I can see it! I would love that! Happy Valentine’s Day, Carla! Thank you!! Best tutorial I have read to make a wreath with a wire frame. Easy to understand Can’t wait to try mine! Oh yay! We’re so glad to hear you found our tutorial to be helpful. We’d love to see how your wreath turns out. Feel free to tag us @kenarryideas on Instagram or Facebook if you share a photo of it! I have taken a lot of interest into wanting to make wreaths myself, I have never done it before, but I’d like to turn this into a new hobby. A hobby that could make me extra money to help with tuition costs. I absolutely LOVE the way you can explained everything thoroughly, it makes complete sense of makes it look so easy. Thank you very much for sharing! When making your wreath did you use wired burlap? I can’t really tell from the video if it’s wired or not. Thanks!! Looks super cute and can’t wait to get started! Hi Kim, great question. The burlap I use to make burlap wreaths like this is NOT wired. It just has a sewn finished edge to reduce or minimize the fabric ribbon from fraying. This is the kind here. That being said though I think you probably could use wired burlap. It would just look a little different. The edges would be more defined/rigid, not as soft and loopy or bubbly as this style of burlap wreath. I’d love to see how yours turns out. Post a pic on Facebook or Instagram and tag me @kenarryideas so I can see! We’re so glad you told us! We wouldn’t have known there was a technical problem otherwise so THANK YOU! THANK YOU! I watched your video and I understand the burlap vs accent pattern. I know there are 4 slots to pull the ribbon through. Is there a pattern for which slots to pull which (burlap or accent) through? Great question, Kennah! There’s no particular pattern. I just typically alternate two loops of burlap, then one loop of accent ribbon, then two loops of burlap, then a loop of the other accent ribbon and I randomly alternate between which two wires I poke through in the frame. The burlap tends to be so filling within the wreath that a set pattern isn’t necessary. Let me know if that makes sense! Enjoy making your wreath! 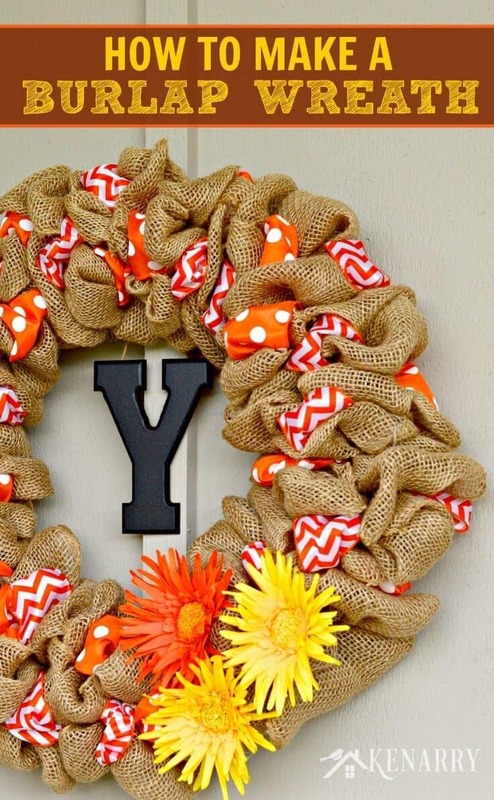 You should have no problem getting your burlap wreath ready by November 2. They’re quick and easy to make if you’ve got your flowers or other embellishments ready to go. I think a Christmas version would be perfect. I hope your daughter loves it! Give me a shout if you have any questions as you’re putting it together. Hello dear friends! I am live in Sweden, I cant get this steal ring in SwedenAny one give a tips? thanks a lot! It looks like Amazon offers these wire wreath frames with International shipping. I’m not sure exactly how that works, but if you give it a try let me know! 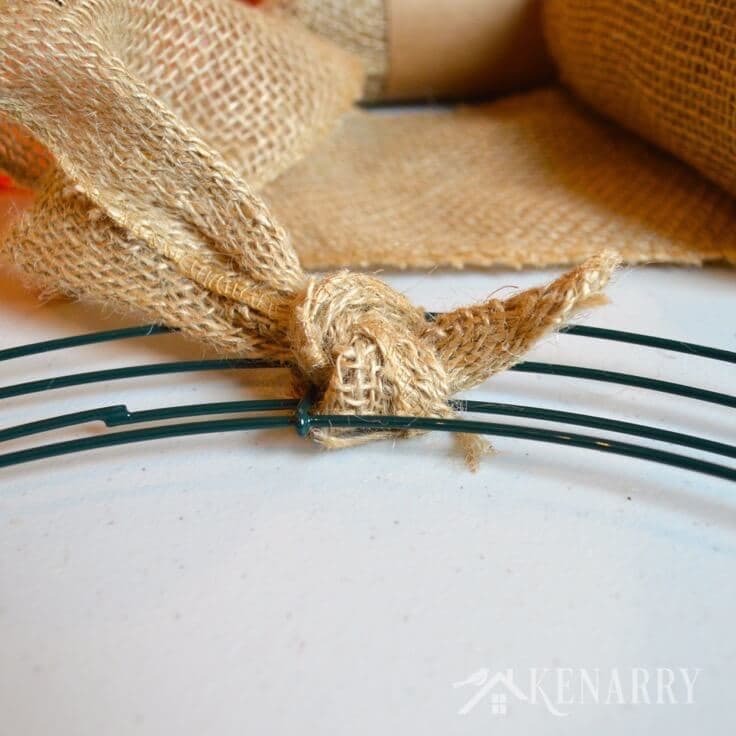 For a DIY way, you may be able to bend wire or wire hangers into circles to create a similar frame to use as your base. Here’s an example of a yarn wreath I made with a wire hanger – Winter Yarn Wreath. Hi! Wanted to say what a beautiful wreath & tutorial! Idk if I seen it correctly but are you staying in the same row on the wreath with all the ribbons & burlap? Great question! No, I’m not staying in the same row. When I make the burlap wreaths, I alternate between each row in the wire wreath frame. Each time I also give the burlap a small twist so that the loops change direction randomly. Hope that helps! Let me know if you have any other questions. I’m here to help! I love the look of this wreath! I’ve had it pinned for quite awhile and have been looking for just the right color combination to make it. I finally found some ribbon that i really like. I’m curious how easy it would be to modify this and use 3 ribbon plus the burlap. Do you think that would work? Great question! I don’t see any reason why you couldn’t do it with 3 ribbons! I bet it will be gorgeous. Send me a photo when you’re done. I would love to see how it turns out!